Newsletters - The Marks Law Firm, P.A. October 2018 Newsletter – Considering a Prenuptial Agreement? January 2018 Newsletter – Happy New Year! December 2017 Newsletter – Merry Christmas & Happy New Year! November 2017 Newsletter – Happy Thanksgiving! January 2016 Newsletter – Welcome to 2016! December 2014 Newsletter – Reflections and Excitement for a New Year! 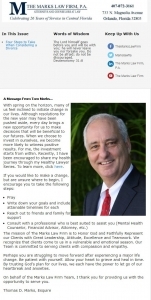 January 2014 Newsletter – Happy New Year from The Marks Law Firm!